Chronic Traumatic Encephalopathy(CTE) was first reported in 1928 by Harrison Martland. He discovered neurological deterioration was occurring in boxers after repeated blows to the head, so it quickly became known as being ‘punch drunk.’ The scientific term was ‘dementia pugilistica,’ reflecting boxing as the source of the injury, but as doctors and scientists identified the same symptoms in other athletes, the name was changed to CTE. CTE is a progressive degenerative disease of the brain found in people with a history of symptomatic concussions and asymptomatic subconcussive impacts to the head. In other words, people who get concussions and hit their heads a lot, even if the impacts are not very hard, are much more likely than the average person to develop degenerative brain disorders later in life. Symptoms in stage I chronic traumatic encephalopathy included headache and loss of attention and concentration. Additional symptoms in stage II included depression, explosivity and short-term memory loss. In stage III, executive dysfunction and cognitive impairment were found. In stage IV, dementia, word-finding difficulty and aggression were characteristic. Football, hockey and rugby are sports that undeniably encourage impacts. They are classic ‘contact sports.’ Every time the quarterback hikes the ball in a football game, linemen slam into one another, rocking their brains within their skulls. Even though helmets significantly soften the blow, there is still an impact on the head and brain! Helmets cannot and will not protect your brain from moving within your skull. Sometimes we, as a society, forget that brain damage is not exclusively found in sports that require helmets. Basketball and soccer players face brain damage when they come into contact with other players running. Imagine a flagrant foul that knocks a shooter down as he is jumping up for a layup. Any time the human body is impacted, the head can be whipped much like we think of in a car accident. The odds of developing CTE from playing contact sports are overwhelming. In an ongoing study by the Department of Veteran Affairs and Boston University, 96% of NFL players and 79% of all football players who donated their brains to science were diagnosed with CTE. 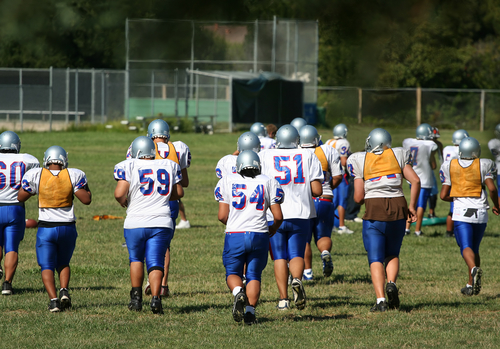 Offensive and defensive linemen appear to be most affected by the repeated impacts associated with the sport - over 40% of the athletes with CTE were linemen. These numbers are admittedly skewed because many of the players who chose to donate their brains suspected CTE or other brain injury, but the instances of CTE in the general population is much lower than in athletes. More advanced stages of CTE correlated with how long players played the game, survival after football and age at death. Put simply, the brain damage became more extensive the longer the athletes were subject to repeat concussions and small impacts to the brain. Professional sports organizations have been implementing policies to protect their players, but the changes are coming slowly. “Iron Mike” Webster, former Center for the Pittsburgh Steelers, filed for disability in 1999, alleging he developed dementia from head injuries acquired on the field and the NFL granted his disability! But, the NFL didn’t ban head tackles until 2013. Lowering the helmet is now a 15 yard penalty and possible fine. In 2013 the NHL decided to penalize the intentional removal of a helmet before or during a fight in an attempt to prevent concussions. The minor penalty is only 2 minutes in the box and an additional 5 for the fight itself. Thousands of athletes have banded together to sue their respective professional organizations alleging the leagues didn’t do enough to protect players from concussions. The ever growing ‘brain bank’ at Boston University allows athletes and military personnel to donate their brains to the school upon death. Participants provide information about their lifestyles, sports history and brain trauma so their brains can be studied. The main goals of the bank are to establish a diagnostic test for CTE in living persons and a treatment plan for those living with CTE.